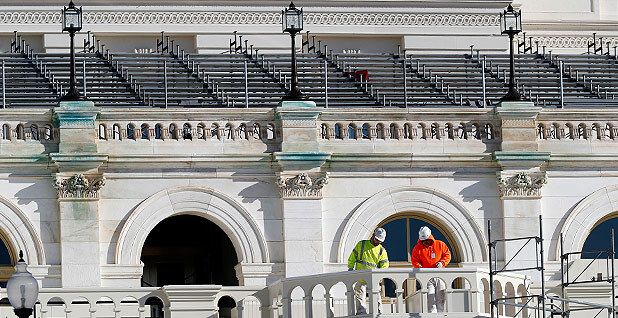 Workers build the stand for the inauguration of President-elect Donald Trump on the West Front of the Capitol in Washington. Trump will be sworn in at noon on Jan. 20 as America's 45th president. Photo courtesy of AP Images. The Republican climate agenda begins today. With the opening of the 115th Congress, the GOP is poised to begin altering the nation's direction on greenhouse gases across the economy, from electricity and transportation to trade and foreign policy. Republican measures once seen as symbolic provocations against a liberal president are now considered mainstream policy. Efforts to reverse rules on power plant emissions, terminate a global climate agreement, rescind the social cost of carbon, and expand oil and gas drilling are all possible beginning in 17 days, when Donald Trump takes the oath of office. The first big collision of 2017 is set for next week. Rex Tillerson, CEO of Exxon Mobil Corp., will appear before a Senate panel for his confirmation hearing as Trump's nominee for secretary of State, setting off a string of battles over the president-elect's choices to lead U.S. EPA and the departments of Energy and State. Democrats and their allies are vowing to make the hearings a public trial over climate skepticism. They say Scott Pruitt, tapped to lead EPA, and Rick Perry, the Energy nominee, are their top targets, based on the nominees' doubtful views of climate science. "Yes, there should be a climate test," said David Goldston, director of government affairs at the Natural Resources Defense Council. "This is pretty late in the day to have climate deniers anywhere in the government, not to mention running the agencies that are responsible for leading the U.S. and, therefore, the global efforts against climate [change]." This year stands to offer a whirlwind of policy changes by a president-elect who questions whether humans affect global temperatures. 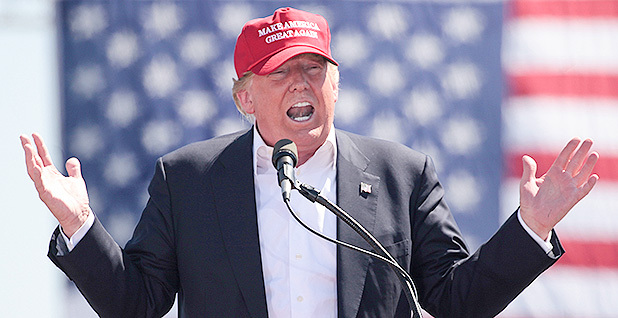 Trump's campaign promises to roll back the Clean Power Plan, withdraw from the Paris Agreement and incapacitate other environmental regulations could dominate most of 2017, according to observers. But there's also a view that Republicans could pursue policies that reduce emissions. Dave Banks, a climate adviser in the George W. Bush administration, said he believes Trump could eventually focus on technological innovations like carbon capture and sequestration. Bush did something similar in his second term by promoting hydrogen cars, biofuels and energy efficiency. And Tillerson might be the leading voice in the administration, Banks said. The oilman accepts basic climate science, making him stand out among Trump and his other nominees. "You're going to have a constructive approach with Rex Tillerson. It's just a matter of when," Banks said. "The EPA stuff will dominate the headlines, but at a certain point it'll start looking, I think, more like a George W. Bush position where we start talking about innovation, we start talking about clean energy technology as a way of reducing emissions without harming the economy." "But if we're talking about [this] year, I might be surprised," he added. Some Democrats say Trump now owns the Republican Party's identity crisis on climate. For years, the party has questioned whether climate change is a problem that needs to be addressed. The consequences were small, because those views were married to opposition against President Obama's policies. Now that the GOP is leading the legislative and executive branches, it could pursue policies promoting nuclear power, research investments in energy technology, energy efficiency and other measures accepted by conservatives, said Paul Bledsoe, a former climate aide in the Clinton White House. "The question is, does [Trump's] team have the political perspicacity and vision to begin the creation of a distinctly Republican climate policy response? Because right now, there isn't one," he said. Trump has vowed to undo U.S. EPA regulations and "cancel" the Paris climate agreement. Photo by Gage Skidmore, courtesy of Flickr. For now, 2017 will be devoted to undoing Obama's climate programs. That work could begin as soon as Trump takes office. But accomplishing it might take time. Eliminating greenhouse gas regulations through the rulemaking process, for example, requires "a lot of documentation and even research," said Mark Muro, a senior fellow and policy director at the Brookings Institution Metropolitan Policy Program. "It's not like you just get to sign a document and it's gone." It's also likely that career staff at agencies could be outwardly cooperative with Trump's orders — but only sluggishly comply with them. Other delays are bound to arise. Lawsuits by environmental organizations over the Clean Power Plan and other Obama-era climate policies could take years to clear up. In the meantime, the power industry stands to experience uncertainty as the Trump administration reshapes the nation's greenhouse gas agenda. That might add its own complications if utilities ask the president for relief from turbulence. "I would look for them to find small, kind of symbolic, theatrical things to do early," Muro said of the administration. "But many of these things will take maybe two to three years if all goes well for them. While there's clearly clear and present danger for some of these regulations, it'll be sort of a slow-moving process." Getting at some of Trump's targets — like exiting the Paris Agreement to curb greenhouse gas emissions or eliminating the Clean Power Plan — won't necessarily require working with Congress. But it would be easier if the lawmakers help. Those familiar with the House and Senate say two key things will be in short supply this year: time and political capital. "What Congress does better than anything else is nothing," said David Bookbinder, a Niskanen Center scholar who has represented environmental groups in clean air litigation. Most action in Congress requires 60 votes in the Senate to overcome a filibuster. Passing legislation means persuading at least eight Democrats to partner with the Republican majority. Some potential GOP objectives, like rescinding EPA's authority to regulate greenhouse gases, would be impossible to achieve without swaying Democrats who are downright resistant, or without changing the Senate rules. Both are difficult feats, especially with limited time. The congressional schedule will also be packed, adding more layers of complexity. Congress could focus first on repealing Obama's signature health care rule, crowding out climate-related rollbacks. In the meantime, the Senate will be overscheduled with confirmation hearings for Trump's Cabinet nominees. Then in March, legislators will have to approve a budget to replace a short-term spending measure. That budget could slash funding for research into climate change and technological improvements meant to accelerate the transition away from fossil fuels. The congressional process for passing spending bills is different from the process for other legislation. It is not subject to filibuster and allows only limited consideration of amendments. That means Democrats will be hard-pressed to stop Republicans from using their majority in the House and their 52 votes in the Senate to rewrite agency budgets. Even if a new budget does strip research and other programs, wind and solar power are expected to grow, pushing more coal power offline. Federal tax incentives will help with that growth. Rescinding those measures, like the production tax credit, would be difficult because they are popular among rural conservative lawmakers in windy states. "If you're looking forward to the next two years and what we're going to see in the meantime, most present market trends will continue. And those are now extremely favorable for natural gas and, in many places, renewables," said Muro. "If there's an emergency here, it's kind of a slow-moving emergency for the decarbonization paradigm." President Obama addresses delegates at the U.N. climate change summit in Paris in 2015. 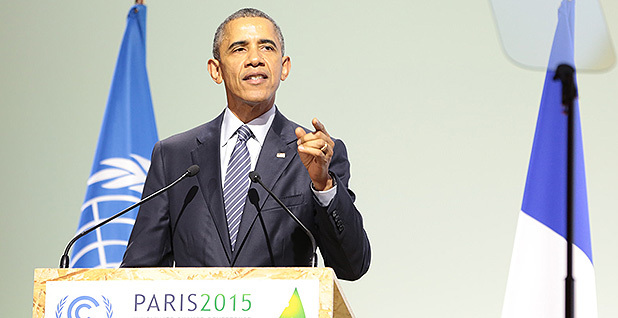 Obama helped broker an accord there among nearly 200 nations to curb global emissions. Photo by the U.N. Framework Convention on Climate Change, courtesy of Flickr. To kill the Paris climate deal, Trump has several options. He can issue an executive order that is immediate but may be vulnerable under international law. Or he can start the process of exiting the U.N. Framework Convention on Climate Change, the 1992 treaty under which nations agreed to the Paris deal. That would take at least a year and would have more permanent ramifications. Alternatively, he could ask the Senate to vote on whether to ratify the Paris Agreement. It's sure to lose. The GOP-controlled Senate couldn't muster the two-thirds vote necessary to make the deal official. Marlo Lewis, a senior fellow at the Competitive Enterprise Institute, said his group thinks "it's highly valuable to reaffirm the Senate's role in treaty-making." "We don't want a Republican version of Obama who thinks that by pen and phone you can legislate everything. We want a president who respects the Constitution," he said. If Trump does not pursue any of those options, his policy agenda and Cabinet picks have signaled that the U.S. will not achieve its climate commitments made in Paris. Even if Democratic nominee Hillary Clinton had won the presidency and ramped up climate action, the United States still would have had trouble meeting that goal — a 26 percent reduction below 2005 carbon levels by 2025. Bookbinder said not fulfilling the global promises will make it hard for Tillerson to negotiate on other issues. "His job as secretary of State gets much more difficult on all the other issues if the U.S. backs out of Paris," Bookbinder said. "You don't generate goodwill and cooperation on issues A, B, C and D if you've pulled out on this incredibly important issue E."
Trump also has multiple ways to eliminate EPA's Clean Power Plan, the rule to reduce carbon emissions from the power sector 32 percent below 2005 levels by 2030. Trump could initiate a rulemaking to roll back the rule. Or he could ask the courts to remand the rule, in the hopes of giving EPA a chance to rewrite it under the leadership of his agency nominee, Pruitt. Under such a scenario, the agency could propose bare-bones efficiency improvements for coal plants and give companies years to comply. It's also possible the Supreme Court could consider the regulation and strike it down. If it upholds the rule, see the scenarios above. Republicans in Congress have already expressed interest in using the Congressional Review Act to strike down regulations passed in June 2016 or later. The 1996 statute allows lawmakers to reverse unfinished rules with a simple majority. But it prevents agencies from taking similar action in the future, and it's only been used once. It's unclear whether industry would endorse that path. Some Republican lawmakers are considering eliminating standards for methane emissions at new oil and gas operations and from those operated on public lands (Climatewire, Nov. 30, 2016). Trump's agencies can also open up public lands for more oil and gas drilling and coal mining. For now, oil prices are low and so is production, so that might temper industry interest. Coal leases might not see a huge amount of interest either, analysts note. On a broader scale, Trump has pitched a $1 trillion infrastructure package, although it's unclear how much of it would focus on energy. Still, advocates say Trump has an opportunity to improve the electricity grid, expand cleaner forms of transportation by investing in high-speed rail and charging stations for electric vehicles, and protect communities against severe weather. "It's about creating the infrastructure for the next economy, not just the old one," Bledsoe said. Republicans are also considering overhauling the tax code, a behemoth political task. And there's already disagreement between the House and Senate. House leaders want to tax corporate revenue instead of corporate income. That would mean taxing revenue abroad and imposing an import tax of up to 20 percent. An import tax would raise the price of everyday goods Americans buy, including from retailers like Wal-Mart that are paying close attention to the tax talks. An import tax could also raise gasoline prices 30 cents per gallon, according to a recent study by the Brattle Group. Within agencies, conservative interests are already pushing for restructuring the way officials consider environmental rules. The Competitive Enterprise Institute wants EPA to focus on meeting its statutory deadlines for writing standards so it won't have as much time to pursue issues like climate change. Myron Ebell, who oversees CEI's global warming program, is heading Trump's transition team at EPA. CEI also wants EPA to stop counting co-benefits of regulations. For example, EPA counted the health benefits of limiting air pollutants in its overall figures for the Clean Power Plan. New agency heads will have wide latitude to change those sorts of protocol.